Its Friday, everyone! Its Friday! And its the last Friday of the month which means its time to share my monthly Card A Month series. I’ve been feeling so unbelievably inspired lately that I made not one and not even two, but four cards to share in this post! Card a month is a monthly video series on my blog. Once a month, usually on the 2nd or 3rd Friday I share a new handmade card along with a video tutorial. I hope you’ll enjoy! This post is a very special one. Its a part of a Winnie & Walter 1st year celebration. Winnie & Walter is a new stamp company with amazing stamp designs! 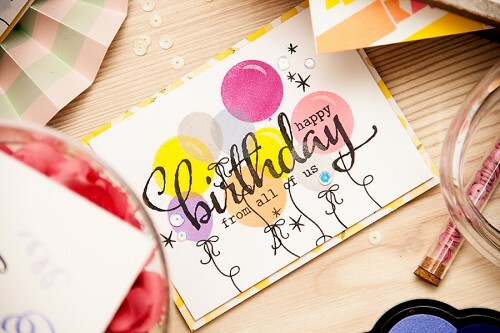 You might have seen their signature style bold sentiments in cards all around the creative web. They also make fun stencils and matching dies too. I had a pleasure of working with their products at the beginning of January and I shared two cards, you can check them out here: Happy Valentine’s Day and Celebrate Today. To help celebrate Winnie’s 1st Birthday I made several Birthday and Party themed cards. Some of these are one layer, some not, but all are stamped. I used several stamp sets from the new January release from Winnie & Walter and I’ll have names of each of the sets I used under every card. I also used a new ColorBox Petal Point ink par from ClearSnap to do most of my stamping. 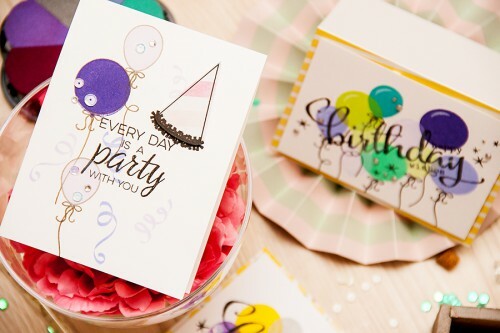 Its a high quality pigment ink that is just perfect for stamping those balloons! I talk more about this ink on my video. Lets take a closer look? 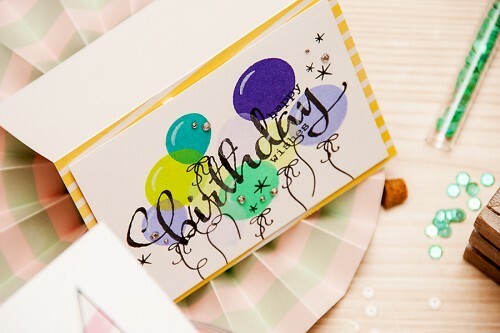 First up are masculine and feminine Birthday cards using three stamp sets: The Big The Bold and The Party (to stamp the sentiment), The Party (to stamp the balloons) and the Sparkle (to stamp the little stars). Next is the Everyday Is A Party With You card. Its a very simple (almost) one layer stamped project. I used just The Party stamp set for this one. 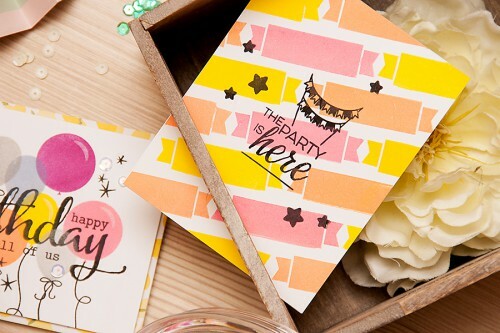 And finally my favorite one – The Party Is here, this is also a one layer stamped project. I used stamps from The Party set as well as Sugar Rush. Like this video? Please give it a thumbs up and share with your crafty friends! Thanks! There are lots of fun giveaways at Winnie & Walter’s blog including The GIGANTIC Giveaway – one lucky person will win EVERY single stamp set Winnie & Walter releases in 2015! To enter you must to go Winnies & Walter’s blog. Fun cards with great tips on the video. I’m sold on these stamp sets, Yana…Thank you so much for the video and for sharing your amazing cards with us! 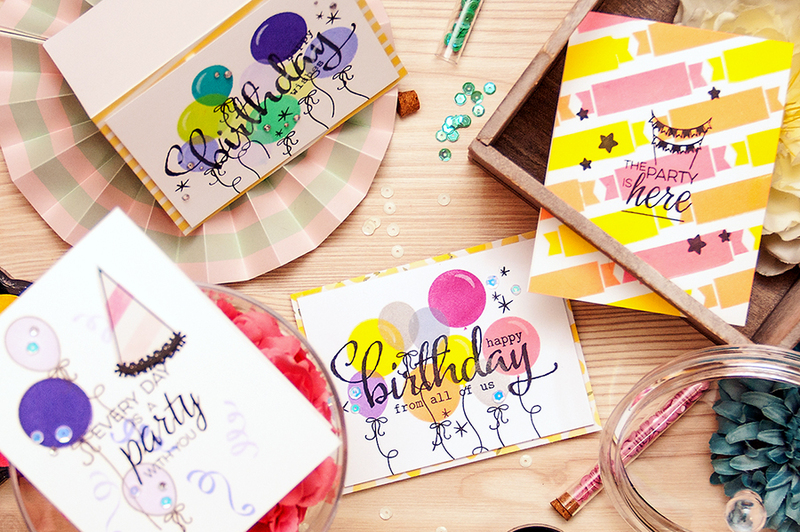 Love, love, love all of these cards! You’ve really outdone yourself and show these products so well that I want to buy them all. I haven’t watched the video yet as I want a quiet chunk of time when I can savor it! I have become an avid follower of yours as I really like your style. Please keep the one layer cards coming! So beautiful and nice to see your creations always! Thanks for sharing the tips and video!! I really enjoyed the video! Beautiful cards and great stamps!! I love these cards. Great job!